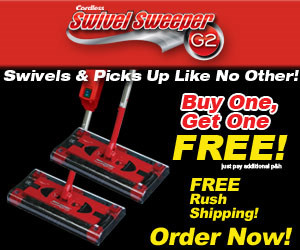 The Swivel Sweeper G2 is the new and improved floor and carpet sweeper that lets you clean dirt and messes faster and easier than ordinary cordless sweepers. It combines the cleaning power of Quad Brush Technology – four sides of powerful rotating brushes and a 360 degree swivel feature to easily maneuver around furniture and other objects. It’s powered by a rechargeable battery and the entire unit weighs only 2 lbs. Buy 1 Get 1 Free!